We are excited to announce the Redfern Mural Gathering, at the Redfern Community Centre, on Friday 13 November! 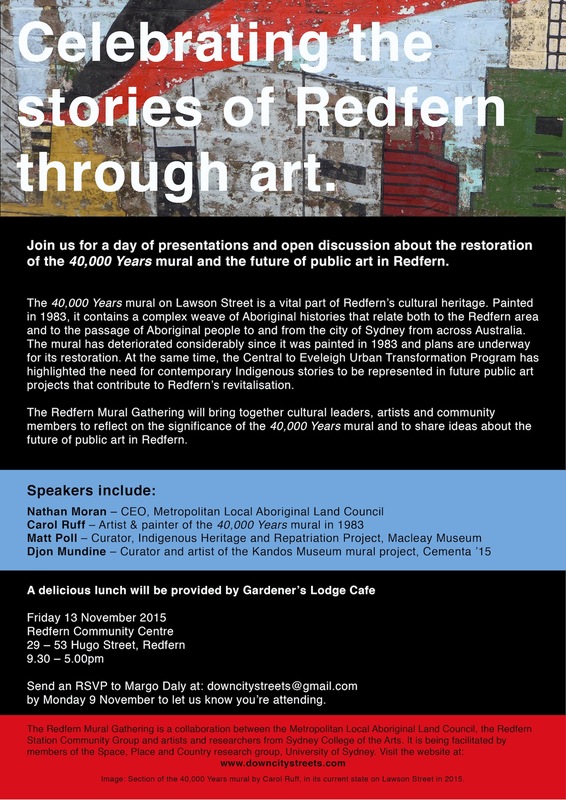 Come and hear community leaders and artists talk about the history and restoration of the 40,000 Years mural and be part of a discussion about the future of public art in Redfern. Speakers at this Redfern mural gathering will include Nathan Moran, Carol Ruff, Djon Mundine, Matt Poll and members of the Redfern Station Community Group. All welcome! A delicious lunch will be provided by Gardener’s Lodge Cafe. For catering purposes please email Margo Daly: downcitystreets@gmail.com to let us know you’re attending, by Monday 9 November.